Kittens! They are so cute with big eyes, sharp claws and inquisitive natures! Is this your first kitten? Then hopefully our kitten checklist will give you a heads up as to what you need! Much like child proofing your home, make sure your home is fairly kitten proof. Kittens like to get into little gaps and will play with anything that looks like fun! This can include electrical wires. Kittens are much better climbers than dogs, so remember this when kitten-proofing! Kittens love a good explore, and they will do this as often as possible! Make sure you supervise your kitten whilst he’s exploring. Allow him some freedom to explore, but be ready to jump in and take him away from dangerous places. For anyone looking to open his or her home to a kitten now is the time to be on the lookout. 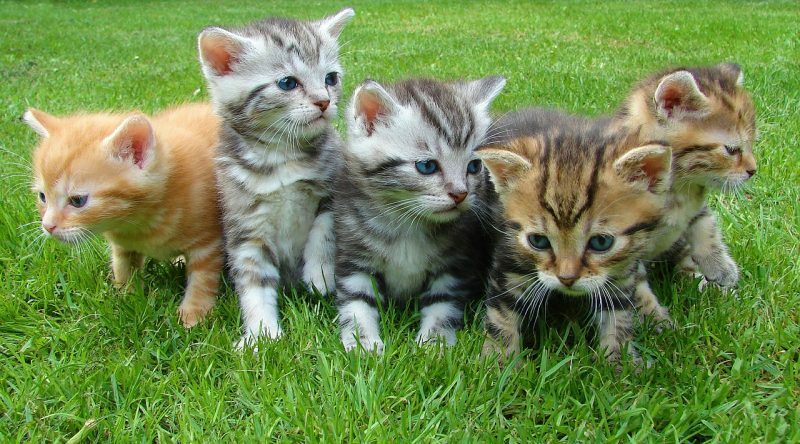 Kitten season in the UK runs from February through to June. Consequently, animal shelters and humane societies are normally teeming with tiny kittens. An unspayed cat or “queen” can become pregnant from as young as 5 months and can have multiple pregnancies in one season. Female cats that come into heat can be incredibly determined when it comes to mating with the neighbourhood tomcat. That is why most vets recommend that cats are spayed or neutered. Should I neuter / spay my kitten? If you are planning to keep your cat indoors when she comes into heat, you had best be ready for a noisy spring. It is not unheard of for cats in heat, to vocalise loudly for 24hours at a time and for your cat to be constantly underfoot. This type of behaviour can go on for weeks. Personally, I think it is kinder to avoid the whole situation and have your cat spayed. In-fact, in 2015 it was one of the stated objectives of Cats Protection to spay and neuter cats to prevent the multiplication of feral colonies. If you are looking for a pedigree cat you will need to think about which breeds are better suited for certain lifestyles and find a reputable breeder. If you are looking for a common moggy then searching cat rescue centres may be more appropriate. If your kitty starts to act strangely of show changes to his or her normal behaviour, it can be a sign that something is not quite right. It is important that any behavioural differences are checked to make sure your kitten is in good health. 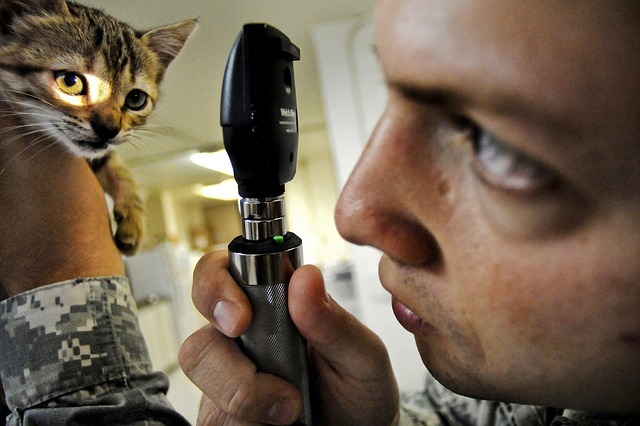 Your chosen vet can quickly and easily inject a microchip into your kitten’s scruff. It is a simple procedure. Once complete, if your kitten gets lost, injured or worse it is easier for shelters and other animal welfare organisations to reunite you and your kitty. Why is vaccinating my kitten important? It is worth noting that you should keep kittens indoors until they are vaccinated. This allows them time to grow bigger, stronger and make sure they do not pick up any nasty bugs before their vaccinations. Vaccinations for kittens normally happen when the kitten is 8 weeks old. He or she will need a second injection 3-4 weeks after the initial vaccination. You should keep your kitten indoors until the course of injections is complete. Use this indoor exploring time to bond with your new kitty. Use her name often, as this will help her to learn her name! Parasites, fleas and worms are common. 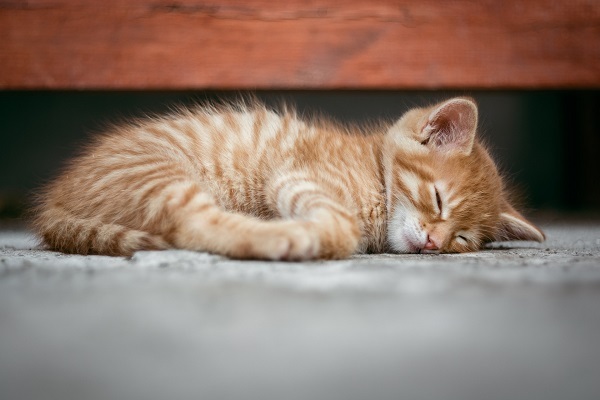 Your kitten will require regular treatments to prevent infestations and your pet becoming uncomfortable or even ill. If you find your little friend behaving out of the ordinary, then please seek advice from your vets. Insurance is necessary with all pets! To be more specific, Lifetime Cover. Some insurance policies will only cover your kitten for 12months per condition and then after that time the condition is excluded from further cover. When you first bring kitty home the previous owner will probably give you a small amount of food that your kitty has been eating. It is best to stick to this in the short-term. This will help avoid upsetting delicate stomachs. If you decide on a different food, it is best to introduce it gradually. As for treats, I say absolutely. They are a great way to build a bond with your new fur baby. Just remember to account for treats in your kitty’s daily food allowance; pet obesity is on the rise and is easily avoided with a little care. As part of a kitten’s natural curiosity anything and everything will seem like something yummy to eat, there are some surprisingly common plants that are toxic to pets. Luckily, kittens are far easier than puppies to house train. Normally, all it takes is for you to show your kitten the litter tray and she will immediately know its purpose. If you have more than one cat in the house, it is advisable to have at least one tray per cat. The type of litter you use is not particularly important. It is, however, important to keep the litter clean. 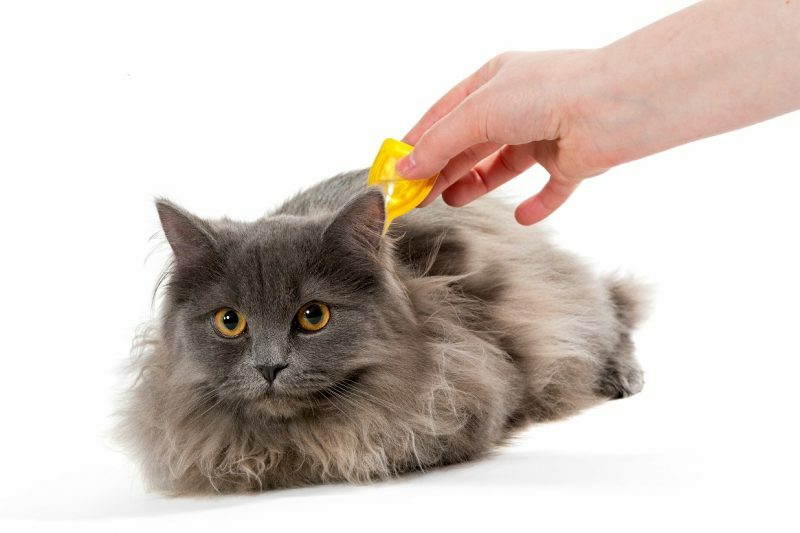 This will help control unwanted cat litter smells and keep your kitten clean and healthy. There are only a few more items to complete the kitten checklist. There are some items that almost go without saying; you will need enough food and water bowls to ensure you always have clean bowls in use. Cats can and will sleep pretty much anywhere. One of my cat’s favourite place is inside a fruit bowl alongside my fruit – which is far from ideal. Therefore, we are encouraging her to use a new bed, which surely must be more comfortable than sleeping on some apples! Kittens sleep a lot. We mean a LOT! They can be so funny when they are falling asleep. You could be playing with your kitten one moment, turn around and he’s nodding off right in front of you! Expect your new friend to sleep a lot in the first few weeks. Provide them with a nice soft, comfortable place to snooze. I would strongly recommend that you invest in some scratching posts. Kittens and cats love to scratch soft furnishings. It keeps their claws healthy and marks territory. 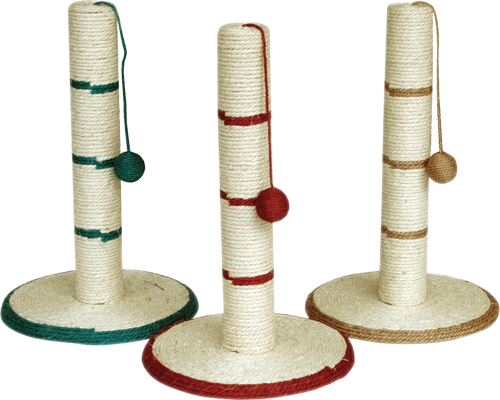 If you can get them used to a scratching post, your sofa will thank you. You could also try making some toys that pets would love! It is ever so easy to fall in love with a kitten and to take her home without fully considering all of the responsibilities. So we hope that this checklist will help you to plan when and how you bring a new bundle of fur into your family. The final point on this list is – have fun. 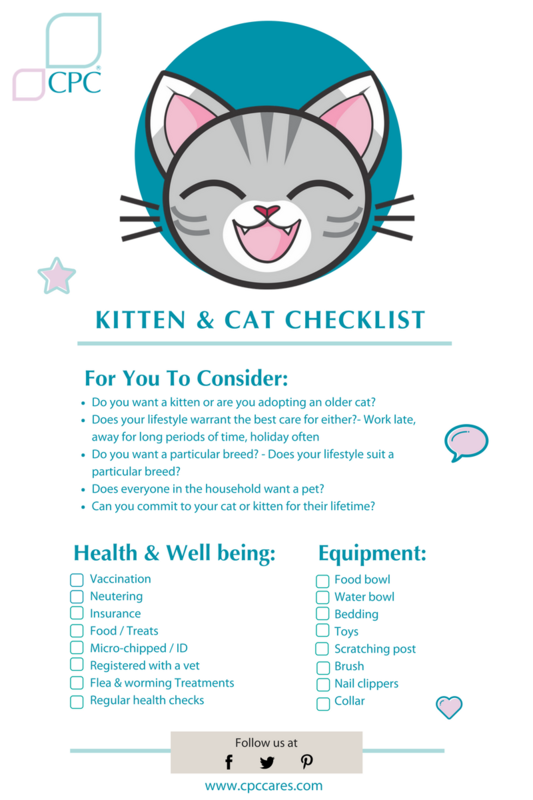 We hope you like our kitten checklist, if you think we have missed anything else. Please leave us a comment below. We really love cats & kittens and would love to see pictures of your little fur balls (big and small, young & old!) on our Facebook & Twitter feeds!